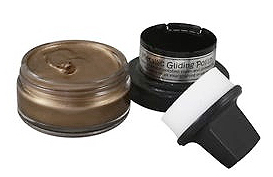 Cosmic Shimmer Metallic Gilding Polish is a waterbased paint with a creamy paste consistency that can be used over any number of porous and some non-porous surfaces. The colours are richly metallic and the paint gives excellent coverage. It is similar to Inka Gold and can be used over polymer clay and dries quickly without issue. The 50 ml glass jar contains a built in sponge applicator - very handy! Cosmic Shimmer Guilding Polish - Lime Burst - NEW!